Danielle from Brazil previously wrote us a report on her trip to the Monaco Grand Prix, which you can read here. She is back to give us the lowdown on her home race. Brazilians love Formula 1 and for those of us who like to watch it live, our home race is by far the most anticipated event of the year. My group of friends and I start planning our trip to the next race when we are sitting in the grandstands at Interlagos a year earlier! The GP Brasil de Formula 1 is held in São Paulo at a circuit named after Jose Carlos Pace, a former Brazilian F1 driver. Most people know the circuit as Interlagos, which means “in between lakes”, and is located in the south of the city. A challenging ‘traditional’ circuit, Interlagos has some famous turns offering a real challenge to the drivers, such as the Senna S, Curva do Sol, Laranjinha, Bico de Pato and Curva do Café. Apart from its design and history, Interlagos is also famous for its uncertain weather and for being one of the last races of the year. The championship is often decided in Brazil and surprises are never too far away! We usually choose a grandstand where we can see the start. For me, it’s the best moment of the race. Seeing the build-up on the grid before the race is exhilarating. The sound of the cars ready to go used to be the perfect song played by the best orchestra. It’s not like this anymore, but it’s still a pretty special moment. 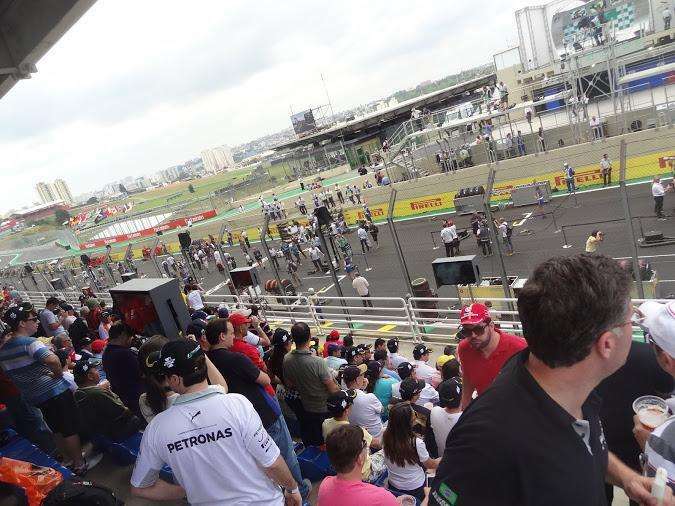 Last year we sat in Grandstand B, where you can see part of the main straight and Subida da Junção, some of the team garages, the start line and grid preparation, pre-race ceremonies, chequered-flag for the winner and podium party. The trade-off is that you don’t the best view of the on-track action. It costs R$2630 Brazilian reals (approx. $970 / €850). Food and drinks are included in the price of the ticket. The grandstand is covered and there are several screens to follow the event. This is much cheaper and represents great value. It costs R$695 Brazilian Reals ($255 / €225). From A, you can see the main straight, end of the grid, several turns and part of the grid preparation. Several team merchandise stands are also behind the stands. The atmosphere in this sector is amazing. There are people from all over Brazil and around the world. Everyone is friendly and just happy to be at Interlagos. Watching the GP from here is a unique experience. Over the years, São Paulo has welcomed immigrants from different corners of the world, which has created an amazing range of different cuisines in the city. You may find food from the whole planet; pizza and pasta are all over the city and there are great Middle Eastern restaurants offering delicious food. The Formula 1 teams and drivers are known to be fond of local all-you-can-eat style restaurants called Churrascaria, which serve meat prepared in a unique and tasty style. It is easy to get to São Paulo from Europe, North America, Asia or Oceania. The international airport of Guarulhos has many daily connections with other parts of the world. The circuit is also not too far from the national airport of Congonhas. There are shuttles between the airports. We travel every year from Brazilia, the capital, which is just 90 minutes away. We usually stay in a hotel on Paulista Avenue, so we are close to a metro station and places to eat and drink. For the Formula 1 race, we recommend finding accommodation in Morumbi, Jardins, Paulista Avenue, Campo Belo or Pinheiros. All these neighborhoods provide easy access to Interlagos, especially if you choose a hotel close next to a train or metro station. After the sessions in the circuit, you can enjoy São Paulo, the greatest city in Brazil. There are many bars, restaurants, theatres, shopping centres, parks and monuments. You can expect a lot from São Paulo’s nightlife. The atmosphere is amazing, people are friendly and there are options for all tastes. Vila Madalena, for example, is full of good bars and restaurants. Weather: it’s unpredictable at Interlagos. Temperatures are not so high in November. Since the circuit is located between two lakes, it is possible to be very cold and wild or very hot and dry, although rain is very common in the region during November. It is not allowed to enter the grandstands with umbrellas. So bring a plastic raincoat if your grandstand is not covered. Language: Brazilians are very friendly and hospitable. However, it is not so common to find many who speak English, particularly away from the circuit. Be ready with a phrasebook or app on your smartphone to help in emergencies. Getting to the track: traffic in São Paulo is chaos. You can get stuck for hours in the same place. It’s best to take the metro or train to get to Interlagos. If you are going to Sector G the train is the best alternative. The station is not so far from the circuit. If you are going to Sector A, the train station is a bit far. Shuttles may be a better choice. For the other sectors, both means of transport are suitable. There are also some parking lots offering shuttles to the circuit. Safety: during the GP weekend, there is a strong police presence, but being alert is always the best way to avoid bad surprises. Food and drink at Interlagos: you are not allowed to enter the track with water. If you think of taking fruits with you, slice them. The staff may ask to check your bag. I would definitely recommend travelling to the Brazilian Grand Prix. The atmosphere is very different from the European races. If I were coming from another country, I would take some time to visit other cities in Brazil. You are invited to come and enjoy the experience. Looking forward to seeing you in Interlagos!!! !